Hello guys! Sorry for the absence this past last month. The main reason i didn't blog anything over the course of March here is because I lost a key part from my tripod, so I'm not able to photograph anything by myself right now. I have been sewing a bit here and there and I have a couple new makes I would love to share with you. Let's hope I find someone willing to photograph me over the holidays(Greek easter) so I can show you what I 've been making. In other news I started taking pattern drafting lessons and I couldn't be happier. I started seeing sewing in a total different angle as I'm learning more and more about pattern drafting. I'll share my projects with you as I'm progressing! Over to this post now, since I don't have any sewing project to show you at the moment I thought I'll share with you my Wardrobe Architect progress. So March's goal was to plan our wardrobe. Now as I previously discussed here my wardrobe consists mostly from basic stuff and I feel it's really boring, so as spring is approaching I'd love to add more fun prints to it and have some visual interest. I decided that this spring, apart from underwear. I'll try to only buy a couple of pair of new jeans that I need, since sewing jeans is something I'm not comfortable trying just yet! I found pattern matches for almost everything in my list and I plan to use my pattern drafting lessons to make all of my skirt and shift dress. I've been a little sneaky and I've started my sewing early. Two skirts and a pair of trousers down already! So what do you think about my plans? 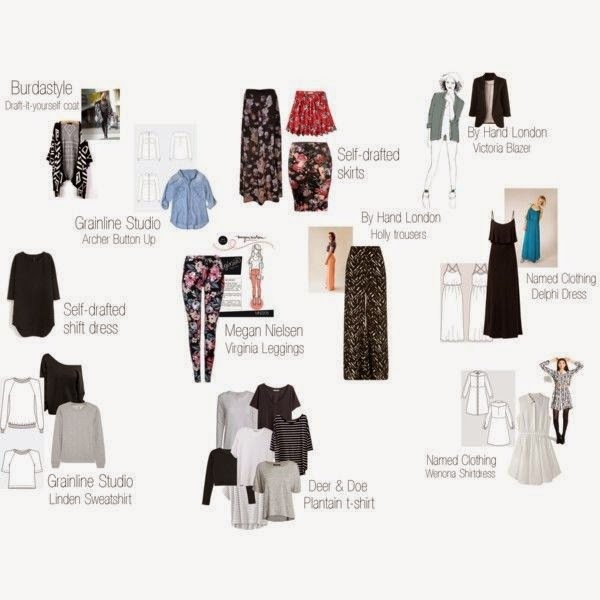 Are you participating in Wardrobe Architect? If yes, how's your progress? That's all so clever! I'm not doing the WA because I moved countries last year, and brought absolutely bare bones... I also changed my hair colour slightly, so my fave orange dresses (yes I have 2) look a bit weird now... so I'm actually filling my wardrobe up with particular things... I love your floral choices, but those Holly Jumpsuit trousers are on my list now... I have the pattern coming in the post, so will make something similar I reckon.